The Alice Chair is ultimate comfort with ‘Hi comfort’ seat interior, super soft filled arm pads and fibre back cushions! The beautiful and stylish suite is made from a birch hardwood frame which is glued and dowelled for extra strength. Light & Dark Feet Options Available. The Alice is available in many size options – Chair, 2 Seater, 3 Seater & Footstool – available please see spec or ask in store! Note: Price Dependent on Fabric & Colour choice. 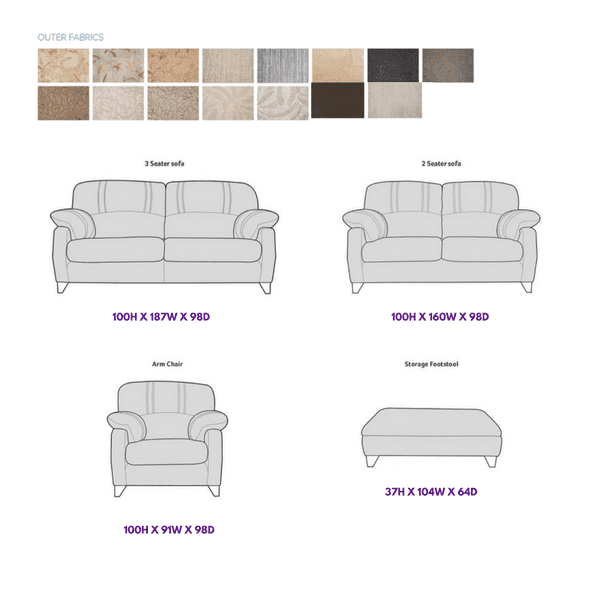 If you would like to see our alternative colour options please call in store to view our swatches. Please note special orders can take up to 8 weeks – Terms & Conditions Apply. Hardwood & composite board frame. Dowelled, screwed, glued & stapled joinery. Light & Dark Wood foot options. Detailed sumptuous fibre back cushions.